We believe children are happier and recover faster at home so we provide many types of care and treatment on an outpatient basis. Some children need to receive care from a nurse, yet they don’t need to stay in hospital. Depending on your child’s needs, they may be referred to the Medical Day Hospital for follow-up care. If your child needs tests or other types of treatment before an operation, urgent tests or procedures, or if early discharge with short term follow-up or follow-up with care from several different services at the hospital is recommended, these may be arranged in the Medical Day Hospital. 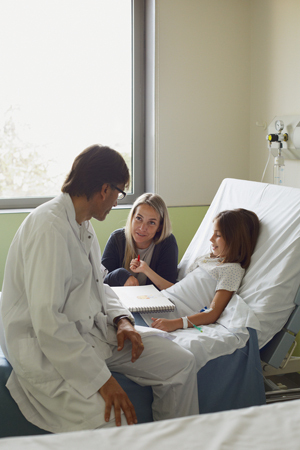 Your child will usually receive care from the same staff you met during hospitalization. They can also help you establish contacts with healthcare providers or support groups closer to home. Your child may need to be followed by doctors or other healthcare providers in a clinic. The clinics are located mostly on the ground floor and 2nd floor of Block A in the hospital. Please bring your child’s Montreal Children’s Hospital card and Medicare card to all appointments. If your child needs to have blood tests, these are usually done in the Pediatric Test Centre  (B02.5118), located on the north side of the second floor of Block B. If you are unable to keep your appointment please call the clinic so your appointment time can be offered to another patient. Depending on your child’s needs, they may be referred to Complex Care Service (CCS). This service provides alternatives to hospitalization for children who need long-term care, home intravenous antibiotics, regular transfusion, etc. The CCS medical and nursing staff provides the necessary support to treat patients/families as outpatients or at the patient’s home. The staff is available at any time for advice and assistance. CCS programs include: hemophilia, bronchopulmonary dysplasia, home ventilation, immuno compromised patients, thalassemia, total parenteral nutrition, home and outpatient IV antibiotics, UTI, neuromuscular disease, palliative care, tracheostomy, and liver/heart transplants.